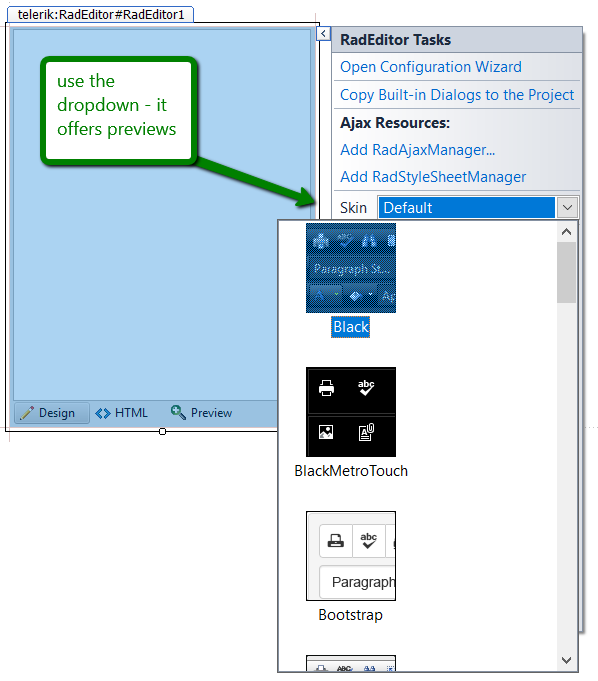 The UI for ASP.NET AJAX controls use Skins to change their appearance. We provide over 20 built-in skins that can fit in the majority of web application designs. The easiest way to set a skin is to use the Design-time Skin dropdown in the Smart Tag of the control. You can show the Smart Tag in Source Mode by pressing Ctrl+..
You can create a few CSS overrides that will implement the small change you seek. Or, you can create a custom skin that matches your requirements. In either case, you may find helpful the Improve Your Debugging Skills with Chrome DevTools blog post. If you experience issues with the control appearance, start by examining the Different appearance or behavior in Internet Explorer on local and production servers KB article.